Falco needs to be unlocked. Although Falco has a horrible recovery, Falco has a chaingrab on almost the entire cast that deals a quick 45%, and can lead to a dair spike (downwards aerial attack). Since Super Smash Bros. Melee, Falco has been "Luigified", and has many key differences from Fox. 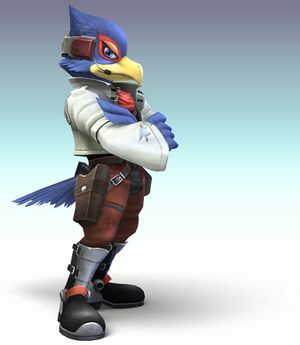 Falco is a medium-lightweight fighter, and while he's more easily knocked back than the average character, his role as one of the most mobile characters in the game lends him the ability to bully damage onto his enemies. 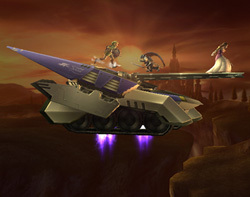 In owning one of the highest first jumps in the game, Falco is able to cover vertical space very quickly and ambush characters floating back down onto the map, which can be used to string down-air moves; hitting the opponent down onto the map, falling into them with another down-air to send them upwards, and then chasing them into the air to hit them down again in midair. While Falco's Fire Bird covers less distance than Fox's respective move, the Falco Phantasm works as a longer-ranged (although sometimes predictable) recovery move. Even using it slightly below the edge of the stage will make Falco lock onto it since his ability to grab the edge is above average. Alternately, an unsuspecting foe waiting for a Fire Bird on the edge can be caught off guard if you use the Falco Fantasm into them. This can turn games around very quickly if you're able to connect, chase your opponent into the air, and then follow up with either his meteor smash or back air. Interestingly, instead of hiding inside his reflector as Fox does, Falco slings it forward with considerable range and speed, allowing Falco some strategic flexibility. Indeed, while the move shortens the time for a projectile to come back to an opponent, the high priority of the reflector is also capable of stopping most dash moves and also most charging moves (i.e: Ganandorf's down-special). Compounding this stopping power is also a small percentage that it will trip your opponent, allowing a counterattack and further widening this move's tactical usage. Falco, while aggressive, is very deliberate when used to his fullest potential. Maintaining the control and being in charge of the rhythm of your assault is extremely important as his speed and his ability to combine moves into strings of attacks can be merciless. With time, even just a single break in an opponent's defenses can turn the game in your favor with Falco's ability to surprise opponents with his ferocious aerial prowess and viscous, unforgiving speed. Wing Spin Slashes two times, then spins his wings. + + + + Falco Roundhouse Does a spin kick. Can be angled. + + + + Wing Cut Cuts two times above him. + + + + Tail Slash Slashes with his tail. while dashing while dashing while dashing while dashing Dash Kick Jumps and kicks forward. Smash + + + (Smash + ) or (Smash + ) or Wing Slash He slashes with his wings. This is his most powerful smash attack. Smash + + + (Smash + ) or (Smash + ) or Power Kick He kicks upward. Covers all around him. Smash + + + (Smash + ) or (Smash + ) or Split Kick He does a split to kick enemies near him. Very, very fast. after grab after grab after grab after grab Falco Knee Knees the opponent. after grab after grab after grab after grab Falco Knuckle Punches the opponent away. after grab after grab after grab after grab Back Blaster Throws his opponent backwards and shoots lasers at him. after grab after grab after grab after grab Sky Blaster Throws his opponent high up and shoots lasers at him. Nearly useless since they can easily evade the shots after being thrown. after grab after grab after grab after grab Ground Blaster Falco throws his opponent on the ground then shoots him with his blaster. This move is a great chaingrab, easily racking up 50% and ending in a dair spike. Wing Flail Flails his wings around. + + + + Woodpecker Drills in front of him. + + + + Rear Kick Kicks backwards. + + + + Flip Kick Does a flip kick. + + + + Spin Kick Spins and kicks downwards. This move can meteor smash. + + + + Falco Phantasm Falco dashes forward, damaging anyone he runs by. Good for a surprise attack through multiple enemies at once, as it will deal all of them good damage. This move can be used to recover big horizontal distances and is a passable way to recover onto the edge. Be careful to not dash over the edge with it, however, as it leaves Falco unable to recover on the way down. It can also be cancelled by pressing the special move button in the middle of the dash. Furthermore, if this move hits an airborne opponent, they will be sent downward, giving this move limited capacity as a meteor smash. + + + + Fire Bird A fiery dash attack. It doesn't cover as much ground as Fox's version, but can still be used to recover. Unfortunately, it is rather easy to intercept, especially with the charging time. + + + + Reflector Deflects any projectile. Falco kicks his reflector forward, knocking anyone that gets hit off balance. Good attack to use in a clump of enemies. He drop-kicks his reflector over his shoulder, bounces it off his heel, catches it again, and says, "Piece of cake." + ( or )+ or or He holds out one wing, raises it, and says, "Don't try me." + He spins around and says, "Hands off my Prey." Press it for only a split second when on Lylat Cruise or Corneria to hear a radio conversation between the other members of Team Star Fox (and sometimes, Team Star Wolf). Landmaster: The controls for riding Falco's landmaster are the same as Fox. The difference is that it is less powerful than Fox's landmaster, but you can stay more time in the air so try to figure out how to use this characteristic. Fly your enemy off the top of the screen while he is on top of the landmaster and you will be able to score a quick KO. This page was last edited on 5 March 2013, at 21:29. This page has been accessed 37,356 times.